Here is a gem of a recipe. Everyone loves this salad. I am not sure if it originated in France or not, but that is how we Croatians call it. It is a must on every Croatian table for all major holidays and celebrations. It is a potato, egg and vegetable salad sliced in small pieces, to describe it the simplest that I can. But that does not do it justice. 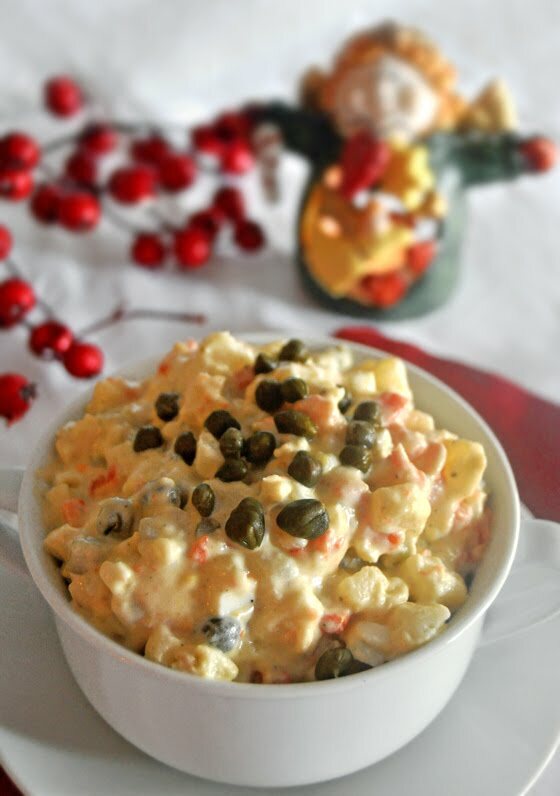 It is soooo much better than any potato salad I ever had, and it is the best possible side dish to a turkey and a sandwich! We eat it with Christmas turkey or duck, with Easter ham, with different cold cuts or if you are my husband, with a big spoon. On it's own. It is the most perfect side dish that I know. One important note that I have is that my parents are from southern Croatia so my version is a little bit different than a classic one you would find in other parts of Croatia. Mine has capers instead of peas and some apple added. I think it is much much better, but tastes are different so you could try both versions. * please adjust mustard and mayo to your taste, it is not easy to measure it exactly, and I feel like every time I put a little more of this and little less of that...these are approximate quantities. Peel your potatoes while they are still warm, but cooled enough to touch. Clean the eggs. Cut all of the ingredients to about 1/4 inch cubes or just a little bit smaller. I always start with carrots and pickles, then do potatoes and eggs. I then add the capers and apple goes last with lemon juice immediately so they don't brown. Mix it a little. Some like to take the yolks out of the eggs and just crumble them a bit and then cut the egg whites. You do what is easiest for you. Season with salt and pepper and add oil. Mix again. Add 3 tbsp of mustard and 3 cups of mayo and mix good. Try it and adjust seasoning if needed. From here add more mustard or mayo as needed. It needs to be nicely covered with a lot of creaminess to it, this is not a diet dish so don't skimp on mayo. You can use mayo light if you want to though, I do it sometimes and like it a lot. I honestly tell you I have yet to meet someone who doesn't like that, unless you hate mayo, of course! This is one dish you should really try to make as a side dish this Christmas no matter if you are roasting a turkey or some other meat. You will especially appreciate it the next few days with your leftover meat sandwiches! The holidays are here, I want to say how thankful I am for many things in my life, specially my husband and son, and another boy on the way. I love my friends, I love this blog and thank you for peeking when you have a moment. It gives me much joy to share my recipes and experiences with you. I wish you and your families a Merry Christmas and the happiest New Year! I love this dish! 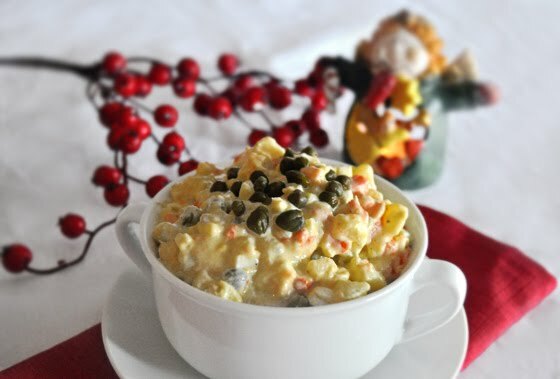 My family is from Poland and this is also a must have on the Christmas table :) This recipe sounds just like what my mother makes minus the capers. I don't think she ever really has capers on hand. I have bookmarked it...thanks! How interesting that you eat it in Poland too. What do you call it there? Your style is really unique in comparison to other folks I've read stuff from. Thank you for posting when you have the opportunity, Guess I'll just bookmark this site.